Written by deanj. Posted on 14 October 2016. Filed under How to. Tagged aged, barrel, bourbon, Jack Daniels, Luxardo, oak, oak barrels, old fashioned, Woodford. Bookmark the Permalink. Post a Comment. Leave a Trackback URL. I aged Old Fashioned cocktails in a mason jar with Jack Daniels oak barrel smoking chips. Oak barrel aged cocktails are amazing. Here’s how to make your own (no barrel required). Chris at Man Made DIY shared his experiment with a few different ingredients for aging cocktails, the clear winner in my interpretation was chips of Jack Daniels whiskey barrels sold for smoking meat. 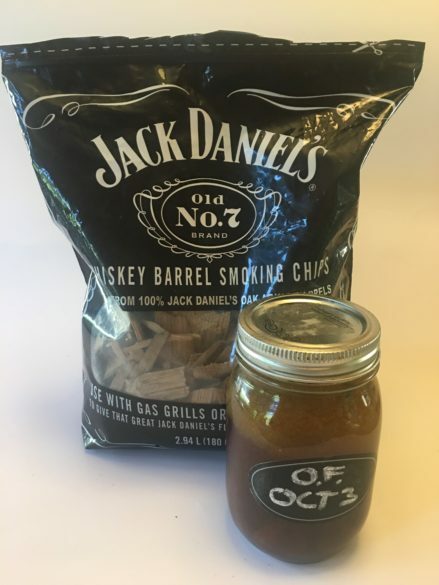 Chris used 8 grams of Jack Daniels oak barrel chips with 6 ounces of liquid. I’ve done some experiments and the best combination is to proceed in his footsteps by making five Old Fashioned cocktails and aging them for two weeks with 17 grams of Jack Daniel’s oak. I made five Old Fashioned cocktails pretty much as normal in a Boston shaker and aged them for two weeks one week with seventeen grams of oak. Edit: originally I was aging these for two weeks. That worked for just doing one or two but at these quantities that was too long. Just age them for a week. Only real difference from a normal cocktail is that I muddle the orange and filter out the mashed peels; then I age the mixture with the five cherries. The cherries turn into little Bourbon bombs and pretty much make the whole exercise worthwhile. Hint: make a little extra for now; you’ll have to wait fourteen seven days to try the rest. I love Luxardo cherries but use Woodford Reserve here for aging (I found that the Luxardos will dominate the drink in a cloying way). I’m making these in 16 ounce Ball mason jars; I tried using old pickle jars but they always smell like pickle no matter what I do to remove the smell.